More than 100 business jets are now flying with the Honeywell-Inmarsat JetConneX global inflight broadband service, with another 50 expected by the end of the year. Fifteen popular business jet models are now certified for JetConneX, allowing passengers and operators to enjoy Wi-Fi that is just as good as they are used to at home or in the office. Work is under way on FAA STCs for another 25 aircraft models large enough to be fitted with the tail-mounted antenna. JetConneX is a partnership between Inmarsat (Booth N2112), with its Ka-band Global Xpress (GX) satellite service, and Honeywell Aerospace (N5100), with its JetWave antenna and associated hardware. In 2012 Inmarsat named Honeywell its exclusive hardware provider for the GX satellite system and then expanded that deal to become the master distributor of GX Aviation services for business aviation. Honeywell has since signed a number of direct providers to package and sell the services. The service was launched at last year’s NBAA convention, and the response has been amazing, says Kurt Weidemeyer, vice president of Business and General Aviation at Inmarsat Aviation. “Manufacturers, maintenance houses and operators saw the value of a reliable, global, high-speed Wi-Fi solution early on and began STC programs well in advance of the Jet ConneX service launch. Together, Inmarsat and Honeywell have redefined cutting edge for connectivity in the industry. The first Inmarsat Global Xpress satellite entered commercial service in July 2014, serving Europe, the Middle East, Africa and Asia. The second satellite launched from the Baikonur Cosmodorome in Kazakhstan in February 2015 to deliver regional GX services for the Americas and Atlantic Ocean region, and the third satellite launched in August the same year to cover the Pacific Ocean region. Global commercial service started in December 2015. As part of Inmarsat’s $1.6 billion program commitment, a fourth Global Xpress satellite was launched in May 2017 to provide additional GX capacity. Weidemeyer notes that Inmarsat’s closest competitor, ViaSat, has only two Ka-band satellites and cannot offer global service until it launches ViaSat-3 in the next couple of years. “Until you commit to that third satellite over the eastern Pacific region and create a global network, it’s really difficult to support business aviation,” he says. Dassault: A line-fit option on Dassault Falcon business jets, including new Falcon 900LX, Falcon 7X, Falcon 8X and Falcon 5X business jets. For existing Dassault customers, Jet ConneX is available on the Falcon 7X, Falcon 2000 and Falcon 900 Series aircraft. Embraer: A line-fit option on Embraer Lineage 1000E executive jets starting in early 2018. Gulfstream: The only global, high-speed Wi-Fi option available for Gulfstream aircraft today. It has already been installed on more than 35 Gulfstream G650 jets only a few months after achieving installation approval for the aircraft. 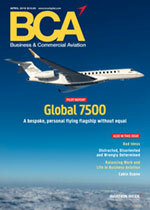 Line-fit availability for the G450 and 550 will begin over the next three months. Boeing: Boeing Business Jet customers can get accelerated install options such as the Two-In-One (TIO) tail-mounted radome, as well as STCs from aftermarket installation and modification center partners on the 737BBJ, 737-700, 737-900 and 777-200, with several additional platforms receiving approval over the coming months. Airbus: Airbus Corporate Jets’ Maintenance, Repair and Overhaul groups were on the cutting edge of Jet ConneX adoption, with several aftermarket centers completing certifications earlier this year on the A319, A320, A330-200, A340-200 and A340-500.